The global market for biological safety testing is showcasing a highly competitive business structure, finds a new research study by Transparency Market Research (TMR). Thermo Fisher Scientific Inc., Merck KGaA, Charles River Laboratories International Inc., Lonza Group, SGS SA, Avance Biosciences, WuXi PharmaTech (Cayman) Inc., Paragon Bioservices Inc., Toxikon Inc., Nordic Scientific & Natural Solutions AB, and NuAire are some of the prominent part of the competitive landscape of this market, making it fragmented. The key companies are expanding their regional reach to strengthen their position in the global market. Over the coming years, vendors of biological safety testing products are expected to involve into mergers, acquisitions, and strategic partnerships to gain a competitive edge, states the research report. According to the research report, the global biological safety testing market was worth US$1.31 bn in 2015. Expanding at a CAGR of 10.0% during the period from 2016 to 2024, the market is projected to reach US$ US$3.08 bn by the end of the forecast period. Biological safety testing instruments is witnessing significant rise and is expected to dominate the global market in the years to come, states the research report. 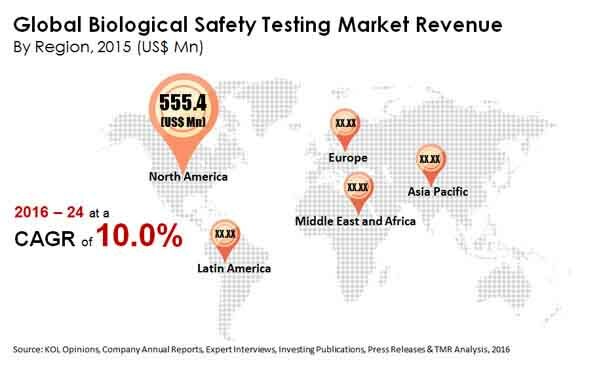 In terms of the geography, the global market for biological safety testing has been segmented into North America, Asia Pacific, Latin America, the Middle East and Africa, and Europe in this research study. Among these, the North America market has acquired the dominance, owing to the presence of a large pool of players in this region. This regional market is anticipated to remain on the top over the next few years. Asia Pacific and Europe are also expected to witness a significant rise in the years to come, states the research report. “The global market for biological safety testing is set to witness exponential growth in the years to come, thanks to the increase in the pharmaceutical and the biotechnology industry,” says an analyst at TMR. Apart from this, the constant increase in the geriatric population, rise in prevalence of cancer, and the augmenting awareness towards health in emerging economies are also expected to support the growth of this market in the years to come, reports the study.